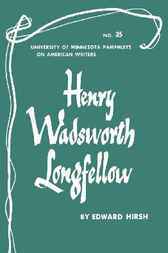 This pamphlet series has been hailed by critics, teachers, and librarians as an ideals means of introducing both students and general readers to American writers of all periods. Choice has commented: "For the small library this series offers at small cost introuctions by reputable critics o dozens of significant authors, and the larger the library the greater the number of undergraduate students looking for a place to start on some writer." The New York Times Book Review has called the pamphlets "extraordinarily good," pointing out that "they are just long enough (48 pages) to permit a real survey of an author's work and short enough to attract the casual reader, the anxiety-ridden student, and the professor desperate for the straight word on an unfamiliar writer."